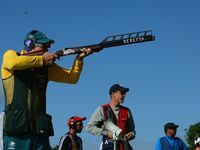 THE Aussies have claimed their third victory of their London 2012 campaign, topping a strong Russian side with a hard-fought 70-66 result that has ensured that they are still in the running for top spot in their group. Despite giving up an early 6-3 lead to the Russians, the Aussies kicked into gear as young Aussie star Liz Cambage began to cause the Russians all sorts of trouble containing her inside the key as she dropped in 7 early points to have her side up 12-9. Suzy Batkovic got it out to a five point lead before their opponents put on six straight to re-take the lead at 15-14. Batkovic stopped the run, before Jenna O'Hea drained five straight herself to end the scoring for the opening term as the team in green and gold had a 21-15 lead off the back off a quarter where they committed no turnovers. 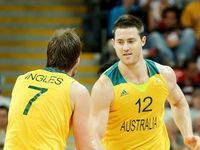 The Russians opened the scoring in the second before Cambage again scored inside and when the Russians again turned the ball over Jarry ran the floor and gave the Aussies their largest lead of the match at 25-17. Knowing the second ranked Aussies were looking to break the game open they rattled off six straight to have the lead back down to two. Suzy Batkovic continued her strong first quarter form and got inside to convert on a three point play and a 30-23 lead. In what was beginning to become a game of mini-runs, the Russians forced Carrie Graff to call her team to the sidelines for a chat with three minutes to go in the half after a Marina Kuzina three had the scores back level at 30-30. Missed shots were beginning to cost the Opals as they failed to convert on a number of good opportunities to again build a lead before the half. As the second quarter drew to a close Batkovic got to the line and gave the Aussies a two point lead with 3.2 seconds to go to have the scores at 32-30 at the major break. The Russians kept up their trend of getting out of the blocks quickly as they claimed a 33-32 lead, but O'Hea, Batkovic and then a three from Harrower with the shot clock expiring had the Aussies lead reinstated at 39-33. Cambage then threw down a massive slam getting her teammates up off the bench as the Russians could not contain the Aussie attack. The Opals pushed out to their biggest lead of the match at 44-33 at the midway point of the third quarter off the back of a 12-0 run. The Russians would not go away though as they got the lead back to six. 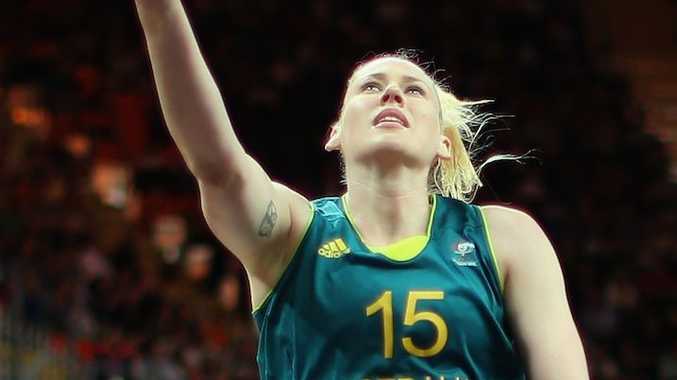 With the lead slipping Lauren Jackson began to get more involved, working hard inside and claiming the next four points for the Australians. With a little over a minute the lead was down to a single basket, 48-45, before the teams traded three point baskets. As the quarter entered its last thirty seconds, Jackson had found her rhythm as she drained another from downtown for the Aussies and gave them a six point buffer, 54-48, with one quarter remaining. Russia's Alena Danilochkina again cut the lead to a single basket as she opened the quarter with a three, but Cambage, Jackson and Harrower all put on points as the pressure began to get to their opponents. The Aussies continued to get second chance opportunites with some strong rebounding but could not bust the game open a s atimeout was called as the scores were at 61-53 with 5:15 on the clock. A strong spin move from Russian captain Irina Osipova off the back of the timeout cut the lead to six before Danilochkina hit another from behind the arc to have the Aussie supporters getting a bit anxious with the scores at 61-58. Jarry stopped the Russians run with a baseline jumper with Jackson helping to rebuild a buffer when she earned a trip to the line, hitting one of her two free throws and getting the Aussies out to a six point lead with two and a half minutes left in the game. When Snell fouled the Russian captain the lead was back to three before O'Hea drained a pressure relieving three as the scores were at 68-62. 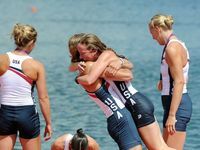 As had been the pattern of the entire game, the Russian weren't done with yet as they put on four straight with baskets to Belyakova and Hammon getting the margin back to two. Cambage then converted from the stripe with 41.7secs. to go to give her team a 70-66 lead. Despite numerous attempts off the back of four straight offesive rebounds, the Russians could not close the gap as the Opals got their third victory of their London 2012 campaign. Cambage was the star with 17 points and 10 rebounds, while Batkovic added 15 points.